Memorial to Louis Kahn or FDR at Southpoint Park? 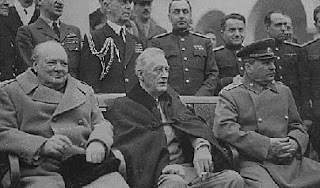 A plan to build a memorial to President Franklin Roosevelt on Roosevelt Island is getting a boost from city leaders, who are meeting today to underscore their support for the initiative. The movement for the memorial, which was designed by architect Louis Kahn almost 35 years ago, needs to raise $40 million by the end of the year; as of July 20, it had collected $5.1 million. The city leaders set to attend the event include Democratic Congresswoman Carolyn Maloney; City Council Speaker Christine Quinn; City Councilwoman Jessica Lappin; New York State Assembly member Micah Kellner, and the president of Manhattan, Scott Stringer. 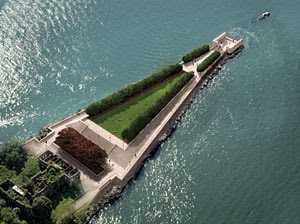 As I have stated before, my impression is that for many proponents of the Memorial, their support is based more upon the desire for a Louis Kahn project in NYC than to honor President Franklin D. Roosevelt, particularly since there is an existing FDR national memorial near the National Mall in Washington DC and Roosevelt Island as well the FDR Drive are named after the late President. The president and CEO of the Roosevelt Island Residents Association, Matthew Katz, said he is concerned that the memorial will cut off views to the east and west. A survey of residents found that most want "the greenest thing possible" in that space, he said. "The Roosevelts were gods in my house, growing up," Mr. Katz said. "Whether this is the appropriate memorial is another question." The association's secretary, Sherie Helstien, said that by resisting Kahn's memorial design, residents are trying to "save the last big community park" in the city. "I think a lot of us are just hoping they don't get the money," she said. "We don't want that thing here." I agree. We do not want any green space nor access to the water from Southpoint's Park removed because of this proposed memorial. the Roosevelt Island Operating Corporation, the state-appointed organization that runs the island, has commissioned a new design by a New York landscape designer for the 14-acre site, known as Southpoint Park. Taking into account feedback from residents and visitors, the design would substitute the granite memorial and overarching linden trees of Kahn's plan with a lawn for 7,000 spectators to view performances on a removable stage. There would also be a sledding hill and a skate pond. 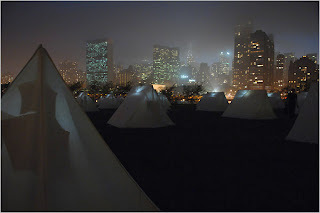 ..."Kahn's memorial was played out in a different time, a different era, a different world," said Herbert Berman, president of the Roosevelt Island Operating Corporation. "It was right for 30 years ago, not for now." 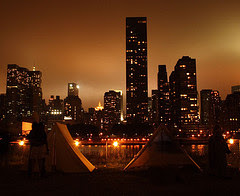 Today, he said, those who live on Roosevelt Island are interested in less formal uses for the land. ...Last April, the operating corporation invited the Trust for Public Land, a national nonprofit organization that helps communities protect and conserve land by developing parks and recreational activities, to come up with new proposals for attracting people to the park and to the island. In November the trust presented the operating corporation with "Wild Gardens/Green Rooms," a picturesque park designed by Mark K. Morrison, a local landscape designer who is currently working on security fencing for the United Nations, as well as on numerous Manhattan playgrounds. The design includes a cafe in the ruins of the smallpox hospital and an earth mound providing enough contour for sledding in winter. The removable stage at the edge of a large lawn would be located at the southernmost tip, where Kahn put his granite room open to the sea. ..."Louis Kahn would have done it differently if he were alive today," said Charles McKinney, the consultant in charge of the Roosevelt Island park proposal for the Trust for Public Land. "He was well known for his concerns about creating communal spaces, and he would have understood the importance of this community's concerns, and he would have responded." Here is a link to the Southpoint Park Conceptual Plans discussed above including the Wild Gardens/Green Rooms concept approved by most residents as well as the Visionary Landscape concept that includes the Kahn Memorial, assuming funding can be obtained. 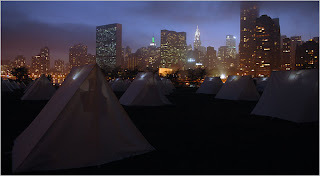 If the proposed Louis Kahn memorial is built, Roosevelt Island loses opportunities for special events that produce views like this from Thom Sokoloski's The Encampment as well as normal everyday experiences of walking down to beautiful green parkland and listening to the sounds of the East River. 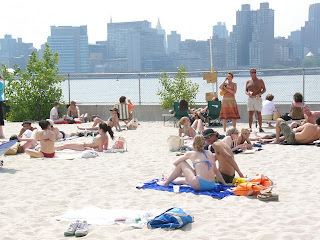 Or maybe even the possibility of importing a sand beach to Southoint Park similar to the one in Long Island City at the NY Water Taxi Beach. It would be a real shame to give up so much potential for Southpoint Park for this memorial. As I was writing this post Curbed picked up story here. 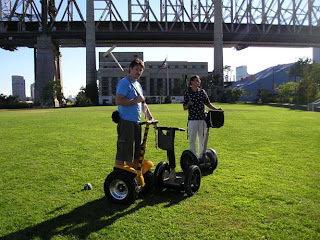 Segway Polo on Roosevelt Island from 2005. Being so small, the entire place is easily traversed by Segway, but moreover, everyone there loved it. Not only did we not get a single complaint/remark, but just about everyone embraced it. THIS, is a perfect place to prove the Segway as something that's practical. If even a small owner population were established on the island, the NY Seg Group is confident that the Seg would catch on to other residents rapidly. Wouldn't it be great to have such an example for Segway use/acceptance? 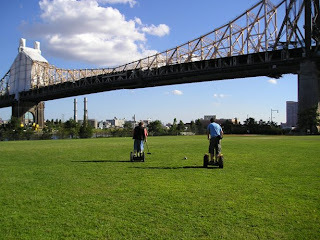 Whenever someone were to comment that Segways aren't useful, we could simply say: "Look at Roosevelt Island!" Whatever happened to the Segway? It was suppossed to revolutionize transportation. Image is from Segway Chat. I will be meeting with RIOC President Steve Shane on Monday to discuss various issues facing the Roosevelt Island community. Please let me know if there are any specific issues or questions that you would like me to bring to Mr. Shane's attention and I will be happy to do so. Image is from The History Channel. 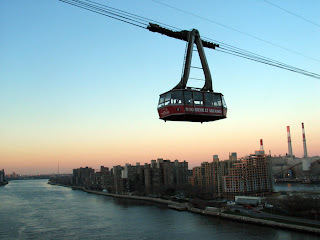 Roosevelt Island Tram Shutdown - How Does it Impact Real Estate Pricing? 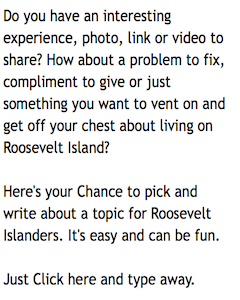 Via Metro NY, Curbed asks the following question. Does closing a major subway station for a year put a dent in real estate prices? Check out Red Hook and Gowanus, because there's a plan to shut down the Smith-9th Street station for a year (give or take, mostly the former). For current residents of Roosevelt Island and those thinking of moving into the new Hudson/Related Riverwalk buildings or the existing Manhattan Park and Octagon buildings, the same question can be asked of the impact that shutting down the Roosevelt Island Tram for at least seven months will have on real estate prices for our little Island. The RIOC Board of Directors voted Thursday night to "go into the marketplace" to pursue the possibility of a revised Tramway in which two cabins would operate independently. The projected cost, should the plan ultimately go forward as envisioned in RIOCâ€™s "Alternative 4," would be $21 million to something over $25 million â€“ perhaps as high as $30 million â€“ in 2007 dollars. The Tramway would be out of operation for at least seven months, but the work would not be authorized without further consideration by the Corporationâ€™s Board, and the actual downtime would not start until after a long period of preparation, perhaps a year. Image is from New York City Walk. 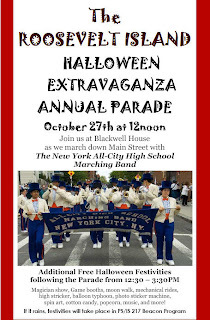 The annual Roosevelt Island Halloween Extravaganza Parade will be held on Saturday, October 27th at 12 PM. Roosevelt Island 360 has a Scarecrow Slide Show commemorating the Day. 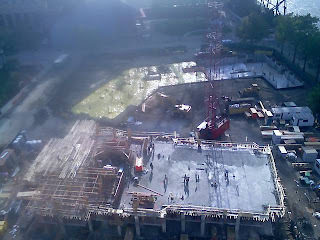 Construction of the new Hudson/Related Riverwalk Condo on Roosevelt Island is moving quickly and sales should be starting soon. What impact will the credit crunch in the mortgage markets have on this new condo development as well as other new waterfront developments in Long Island City (Powerhouse and Foundry developments) and Williamsburg (Edge and Northside Piers)? What happens to all those new development buyers that are currently in contract, waiting for building completion to close, if the jumbo credit markets continue to be in distress and there is a much different lending world than when the original contract was signed? What if the buyer doesn't have the doc's to get the commitment, if lending/underwriting standards have tightened so much in the past 3-6 months? What if the buyer gets a much higher interest rate than was originally anticipated? What if the bonus doesn't come in as expected? What if they lose their job? What if the property becomes unaffordable? While these are valid questions, they are also on the doomsday side and must be looked at with an open mind; after all, if it wasn't for new dev units we would have an extreme shortage of supply! This is a very wealthy city, with great salary's / bonuses and plenty of qualified demand. But with some 17,000 - 20,000+ units set to close in the next 1-2 years or so, questions should be raised given the change in the macro environment and re-pricing of risk in the mortgage markets! Strange how this topic has not been raised in the major media? Too negative maybe? I received message yesterday from RIOC President Shane in regard to this earlier October 11 inquiry regarding the proposed, now approved, Roosevelt Island Racquet Club License Modification. Thanks for the reply. 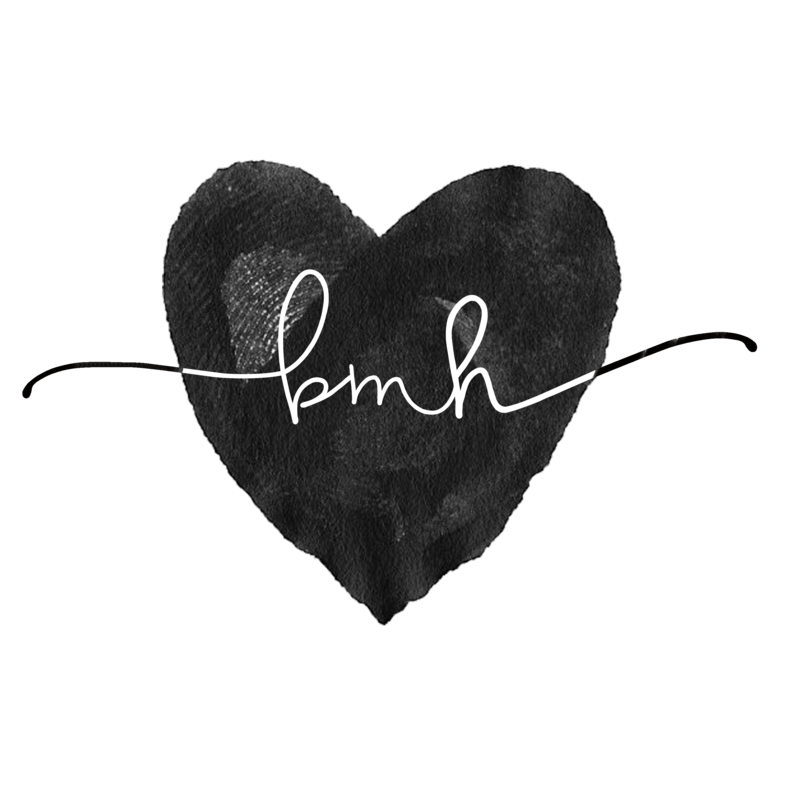 I will post later today or tomorrow. 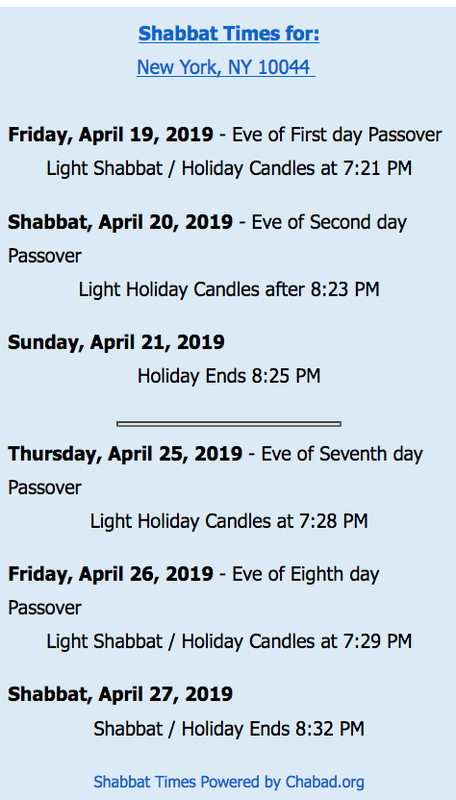 You are right that I knew you were out of town last week and may not have been able to respond to my inquiry of !0/11. That is why I also copied Erika Wilder, RIOC's community relations officer, so that I might get a response prior to the Board meeting when such information would have been of use to the community. if she is not the appropriate person to contact in your absence, who would you suggest to be the contact person in the future? Here are the questions and Mr. Shane's answers. Mr. Shane's replies are indented. When Mr. Shane references a "schedule" to 9/27/07 memo he is referring to the memo that is included in this earlier post and I inserted the relevant portion into his answer. What is the approximate square footage of the premises? I understand from the webcast of the Real Estate committee meeting that the current base license fee is $225 thousand with approximately an additional $60 - $70 thousand in % fee. Is that correct? What is the new proposed license fee? How does the license fee for the Roosevelt Island Racquet Club compare to other similarly situated clubs in New York City? Is it comparable in terms of fees and term? Is it even a relevant question? Other racquet clubs not relevant. We have ours. The property is devoted to recreational purposes in the GDP but unusable as "open" space because of the shower of auto parts from the bridge and is already under license to 2031, now as extended. Since the current license term extends through 2031 why does it have to be extended for an additional 15 years? The waiver of any potential liability for tram discontinuance does not seem reason enough to justify such an extension. After all there have been previous occasions when the tram was out of service and to my knowledge no such liability occurred. The willingness of the Tennis club owner to spend additional sums on a market study to determine the potential of a business opportunity for themselves hardly seems reason for RIOC to extend the license term either. Please explain what benefit does RIOC receive in exchange for the additional 15 year term? 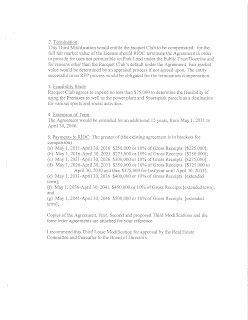 There was no "have to be" about the extension, but was part of the negotiation. Your judgment about the value of the waiver of liability for tram discontinuance is, of course, your judgment. While no action was brought for prior outages of the tram, the issue exists. Why does the Public Authorities Act not apply to such a large space as the Tennis Club with a license term extending to the year 2048. These premises are not the small shops on Main Street where applying the Public Authorities Law makes no sense. The Public Authorities Act does, in literal interpretation, apply to each space, including the Tennis Club. Extension of the existing license is deemed by RIOC to be not subject to the immediate application of the PAA. Any significant change (see the possible results of the study, as yet unknown) will require an RFP.